Catch Basins, also known as storm drains or curb inlets, are openings for storm drain systems which catch debris and sediments through a grate, curb inlet, or sump. The purpose of a catch basin is to prevent items such as trash and other floatable materials from entering the drainage system, and the waterways which it empties into. Catch basins typically begin with a gated hood, which prevents large items from being carried by water into the drainage system. On combined sewer systems (where sanitary waste and storm water share the same pipe) there’s a flapper fitted to the outlet pipe, which prevents the backflow of odors which may be present in the sewer system. Catch Basins aid the sewer treatment practices, as they allow larger sediments to settle in the basin’s sump areas. Additionally, Catch Basins filter out pollutants to protect water quality. 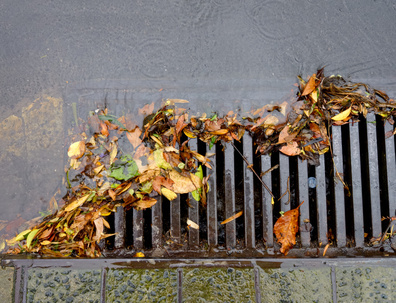 In order to sustain proper drainage, catch basins must be cleaned regularly to remove the debris and sediment in the sump areas, to continue to allow the free flow of water. A catch basin that’s full of debris and sediment will block the entrance to the sewer and drainage system, and will often cause improper water drainage and flooding. Clogged catch basins are often the cause when parking lots or streets are flooded, which can be prevented by having catch basins cleaned regularly. Clean Basins has a fleet of late model jet-vac combo trucks which specialize in catch basin cleaning. By using high pressure water jetting equipment and industrial strength vacuums, Clean Basins jet-vac trucks are able to clean catch basins both efficiently and effectively. Clean Basins recommends that catch basins are cleaned before they are half-full, in order to maintain sump capacity. In most areas Clean Basins recommends for catch basins to be cleaned once a year; however, areas that receive above average debris accumulation should have catch basins cleaned more frequently.